New members are welcome to this club. This is very much a hands-on club, and our meeting format reflects this. 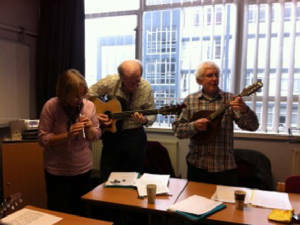 Every member present gets to entertain the others by taking it in turns to sing or play (or both). We often team up to form impromptu duos, trios etc as the fancy takes us. We have even enjoyed the odd poetry recital! Relaxed music-making in a friendly atmosphere is what we do. 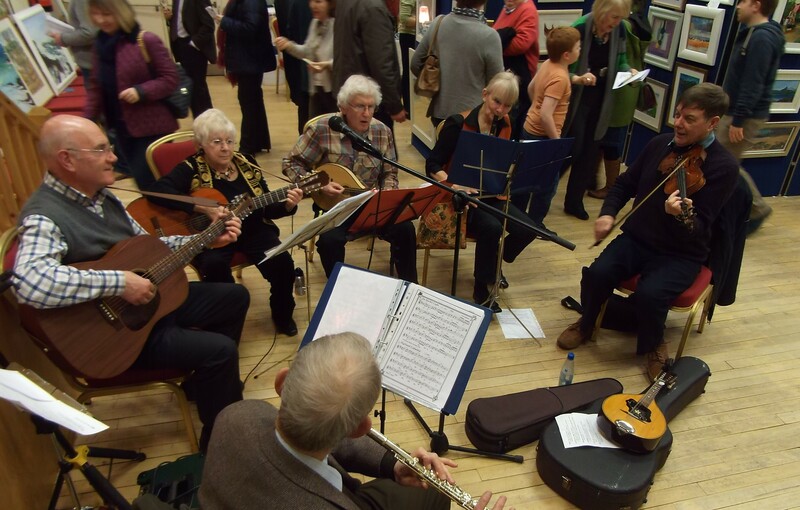 Our members come from a fair range of musical background and this is reflected in the different songs, tunes and styles you’ll hear. Instruments currently being played include guitar, ukulele, mandolin, whistle, harmonica, fiddle, autoharp, tenor banjo, dobro, flute, melodica, mandolin banjo and even a cigar-box ukulele! New recruits are welcome, but bear in mind we have to cap overall membership levels to allow for two “rounds” of performance per member at our 2 hour meetings. You can come along and try us first before deciding whether or not to join. Although most members will sing a song or play an instrument, there is no pressure to do so. Members can just sit and enjoy the music if they so wish. 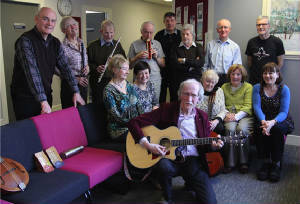 4 members of the Traditional Music Club took part in an inter-generational European Project along with students from the Scottish Royal Conservatoire in Summer 2012. This exciting project involved Irene Conway, Alan Falconer, George Smith and Alan Knox along with 3 students from the Conservatoire. It was considered by all involved to have been an extraordinary experience, with both sides of the age divide deriving great benefit as well as enjoying excellent camaraderie. Later, Alan Knox and RSC student Marissa Manuel were selected to accompany 3Ls project representatives to the Mix@ges Sumposium in Vienna in Nov. 2012. They reported an uplifting experience and the Glasgow contribution was noted as being unique, the only practical music-based project of all the places represented.